Facebook held a big event yesterday to show off the new android app setup called Home. You can read all about it on Facebook's official landing page, or at The Verge. They also showed off the HTC First at the event, which will be the first device to come with Facebook Home preinstalled. Essentially, Home is an Android launcher that is very Facebook centric. Long time Android users will likely be familiar with replacement launchers, but here's a quick summary: on Android, your main homescreen with icons and widgets is actually an app itself. You can download alternate homescreen apps (called launchers) from the Play Store. Some, such as Nova or Go Launcher are similar to the standard ones, but with added features. Others, like Launcher 8 or iLauncher completely change the look and feel of your phone. Android makes this easy by allowing other homescreen apps to replace the standard one, no rooting or hacking required. So with Home, Facebook has now created their own launcher which ties directly into your Facebook account to display updates, pictures, chat messages, etc. front and center. Facebook describes it as focusing on people, not apps. 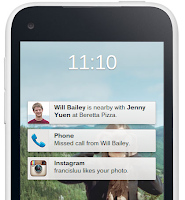 Initially, Facebook Home will be available on the HTC First, but will later be available for download in the Play Store. It will only work on a few phones at first, but Facebook promises more compatibility going forward. So what do I think? I'm going to go on record predicting that Facebook Home will be a big hit. Tech industry pundits will look back on this as potentially one of the smartest moves the company has made. The phone they showed off is a throwaway, budget device simply meant to show off the new launcher. I don't think Facebook or HTC expects to sell many of them. But the genius is that they don't have to. This time next year, there will likely be millions and millions of "Facebook phones" out there, as users of any other Android device decides to try out the new launcher. Facebook has a billion users now, so even if a small percentage of them use Home, it will be a smash hit. I personally don't plan on using it, since I'm not at all invested in Facebook's system. But I'll certainly give it a try just because I'm curious and like new things. Facebook says that this new Home idea will be their main mobile strategy going forward, so we can expect to hear and see lots more about it in the coming months.